Over The Baggy: Twins targeting another player from the Far East? Twins targeting another player from the Far East? Christensen’s statement may be based on some internal rumblings or it may be a residual of the Twins pursuit of him last offseason. Last winter, the Twins came in a distant second to the Oakland A’s for the rights to negotiate with Iwakuma and his agent. Minnesota offered $7.7 million to the Rakuten Golden Eagles but was thwarted when the typically miserly A’s submitted a bid of $19.1 million. After Oakland secured the rights, the negotiating part took a wrong turn for the Bay Area organization. According to reports, Iwakuma and his agent were seeking a “Barry Zito-like” contract (seven-years, $126 million) while Billy Beane went all Moneyball on them and offered a four-year, $15.25 million deal. Unable to work out a deal, Iwakuma went back to the Golden Eagles for the 2011 season. Iwakuma, now an outright free agent this winter negating the need for a posting fee, has hired a new agent and figures to be one of a handful of talented pitchers on the market. Outside of CC Sabathia and CJ Wilson, Iwakuma likely falls in the same category as Edwin Jackson and Mark Buerhle (minus the experience). If he prices similarly to those two, he could be looking at a contract worth $8-to-$11 million per year. The 30-year-old right-handed pitcher has some legitimate sink which would incite plenty of ground balls. Like the rest of the Twins’ cadre of pitchers, he fits the bill as a pitch-to-contact type with his 89-to-92 mile per hour sinking fastball. He comes equipped with a variety of pitches and speeds, using a curve, slider, splitter and a shuuto. The results in his Nippon career have been solid – a career 3.25 ERA with a 107-69 record while strikeout out 18.4% of batters faced. With that vast repertoire and an out-pitch like his splitter, his ceiling could be like that of the Angels’ Dan Haren, who has average velocity but throws a variety of pitches and has a devastating split-finger fastball. The question is: Would he be a good fit with the Twins? Without a doubt, the Twins need to address the depth of their rotation. Last year’s team floundered when several members were sidelined over long periods of time (Baker, Blackburn and Liriano) and were hurt even further when those who were expected to perform simply did not (Liriano and Duensing). This put a lot of stress on a weak bullpen. In theory, Iwakuma, who has worked deep into games in Japan, throwing 48 complete games in his career, would be a decent solution. But that doesn’t necessarily make him the ideal solution either. The second concern is regarding targeting another pitch-to-contact arm. While I have no qualms with the method, it only works provided the right infrastructure is in place. Last season showed that when the infield defense is substandard, those types of pitchers who allow balls to be put into play suffer heavily. If the team is not willing to upgrade defensively around the diamond, pursuing an arm that is capable of missing bats is likely a better investment at this point. 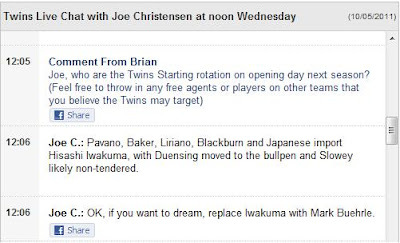 Finally, how much does the Twins front office trust their scouting staff when it comes to pulling talent out of Japan? The ballad of Tsuyoshi Nishioka should already give them pause. Sources say that the scouting department was none too thrilled by Nishioka’s skills overseas but yet the staff signed off on his ability before handing him a $9.25 million deal. Would they actually return to that well so soon after Nishioka’s disastrous year? 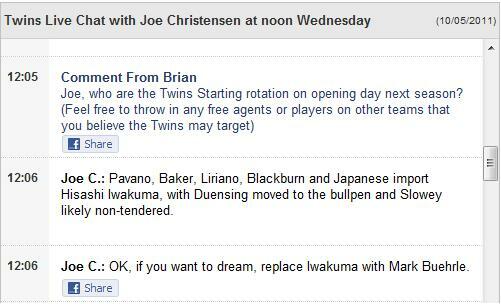 In the end, the Twins will likely be looking for another starter and Iwakuma will be a name you hear repeated again this offseason.